The Dutch sailor and explorer Dirk Hartog was the second European to land in Australia on 25 October 1616. On the way to Indonesia from the bottom of South Africa, the strong westerly winds appear to have taken him off course and instead he made landfall at an island off the coast of Shark Bay, Western Australia. A large local festival is underway at Denham this week and over the last 3 years there has been an ongoing program of events in Western Australia. 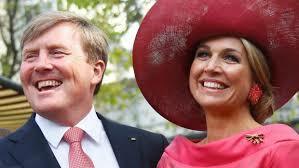 The arrival of the Dutch King and Queen on 31 October will allow their participation as well. Since the since the early explorer arrival, Dutch visits to Australia are common and between 1947 and 1971 around 160,000 Dutch people emigrated to Australia. This state visit to Australia will focus on confirming and expanding the historic and broad bilateral ties the Netherlands has with Australia. The business link between the Netherlands and Australia has also grown over the years, with the Netherlands consistently among the five largest investors in Australia. And for Australia, the Netherlands is the second most important market in Europe. Accompanying the Royal Couple is a wide ranging trade delegation who will undertake many engagements during the trip. City-cat trip on Brisbane River and visit to modern Australian and Aboriginal art. On conclusion of the visit in Brisbane, the Royal couple then head to New Zealand. In preparation for his forthcoming trip to Australia a group of Australian journalists visited the Netherlands. In an interview with the King, SMH journalist Nick Miller provides an informative perspective on how King Willem Alexander approaches his role, along with an interesting comment on his changing role in water activism.